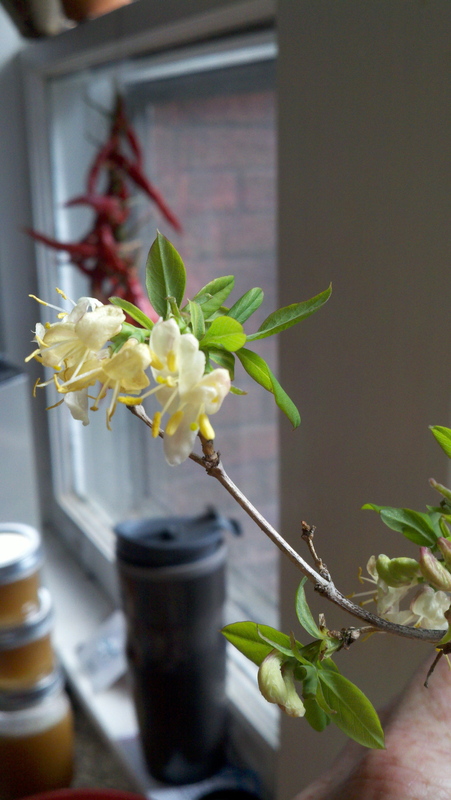 Well, this isn’t a shortia bloom, which G. Welch sings about, but instead the bloom of a honeysuckle bush, also called Sweet Breath of Spring. There’s a place on my running route up on Sunset Mountain where there’s a patch of them. The shrubs themselves are nondescript, but the fragrance is distinct, strong and surreal when I’m out running in the cold and everything is dreary gray. The first time I noticed the smell, I thought I was having an olfactory flashback to 1978 — I swore I was smelling Froot Loops while I was running on Sunset. (Ah, sweet forbidden Froot Loops — I only got to eat them at friends’ houses, we only got Cheerios, bleh). This time every year, I interrupt my runs to stop and smell them (and occasionally I’ll break off the end of a stem and take it back to the house with me to enjoy the fragrance inside). They definitely mean the end of winter for me — finally! !